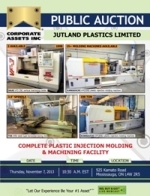 Corporate Assets Inc. | Jutland Plastics Limited - Corporate Assets Inc. COMPLETE PLASTIC INJECTION MOLDING & MACHINING FACILITY FEATURING: HAAS (1998) VF3 CNC vertical machining center; HAAS (1997) VF3 CNC vertical machining center; TOS W9A table type horizontal boring mill with tailstock and dro's; (13) KAWAGUCHI horizontal plastic injection molding machines from 45 ton to 400 ton capacity; Large Offering of molding support equipment consisting of robots, chillers, temperature controllers, drying hoppers & material feed systems, 5+ granulators and MORE! ; JAKOBSEN SJ16 hydraulic surface grinder; STAHLKRAN 7 ton double girder crane and free standing crane system; RICHARDS 3 ton free standing crane system; ATLAS COPCO (2001) 30HP air compressor; Large Assortment of BRIDGEPORT milling machines, tool room surface grinders, engine lathes, saws, forklifts, shot blast systems, welding machinery and accessories, large assortment of precision tooling and machine accessories, boring mill angle plates, KENT pad stamper, tool cabinets and tooling, large assortment of inspection tooling, raw material steel inventory, hydraulic presses, office furniture & equipment and much MORE!